The history of Buddhism distribution in Ukraine began in 1988 when ven. Dorje Jambo came from Buryatia to Donetsk. At first as the lay follower of the Dharma, and since 1989 this time as a monk, he began preaching the Buddha's teaching. Thanks to his preaching first lay followers and then monks appeared in Ukraine. Immediately after the collapse of the Soviet Union in 1991, it was registered first Buddhist community in Ukraine in Donetsk city. Later the same year two regional Buddhist communities were registered: in Lugansk and Kharkiv, as well were appeared Buddhist groups in Kiev, Moscow, Belarus and Bashkortostan. In 1993, the leaders of these communities and groups decided to merge into a single organization - the Spiritual Administration of the Buddhists of Ukraine, the head of which - Choje-lama - has been unanimously elected ven. Dorje Jambo. One of laywomen endowed to the Order her house with some land that year. 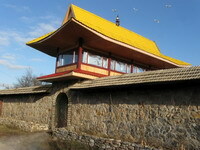 On that place the first time in Ukraine Buddhist monastery - Sheychen-ling Temple - was founded. This lay woman took monastic vows and became the first Ukrainian Buddhist nun taking the spiritual name Tarma. Without any outside help, often overcoming the resistance of authorities, first Buddhists managed in just a few years to sow the seeds of the Dharma in thousands of souls, turning the teachings of the Enlightenment in the spiritual, cultural and social life of Ukraine. Nowadays the Spiritual Administration of the Buddhists of Ukraine is coinciding about 20 Buddhist communities and groups in various regions of Ukraine, as well as the only one formally acting Buddhist monastery in Ukraine, Sheychen-ling Temple. 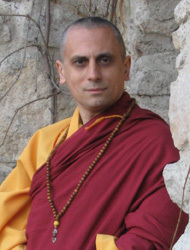 Canonically The Spiritual Administration of the Buddhists of Ukraine belonged to the ancient Tibetan Buddhist Nyingma school ( "Old School"), which, in its turn, refers to one of the three traditions of the Buddha's teaching - Vajrayana ( "Diamond Chariot"), which is practiced in Rime spirit - " non-sectarian " where all traditions and schools of the Dharma are concerned with both equal and deserve to equal respect for Enlightenment path. Nyingma School of Tibetan Buddhism dates from the Indian master Guru Padmasambhava, who arrived to Tibet in 817 AD at the invitation of King Trisong Detsen (742-797) to subdue evil spirits, which were preventing the spread of Buddhism in that country. This great teacher, later known as Guru Rinpoche, put vows on local demons and turned them into defenders and assistants of Buddhism spreading. Later he, together with the great bodhisattva Santaraksita, built the Samye Monastery, which became the main training center of the Dharma in Tibet. Ibid at the Tibetan language were translated many texts included in the treasury of the Tibetan Buddhism literature. 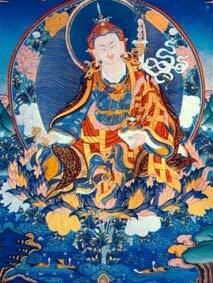 Guru Rinpoche gave his twenty-five main disciples the secret teachings of the upper tantra levels. These first Tibetan dedicated ones were famous for their spiritual achievements. 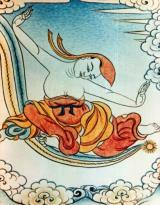 For example, Namkha Nyingpo could travel by the sunlight, Khadro Yeshe Tsogyal raised the dead, Vairocana possessed spiritual insight, Nanam More could soar in the sky, Kawa Peltseg read the other people thoughts, and Jnana Kumara was endowed with magical powers. 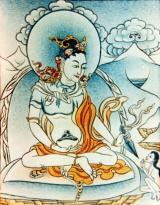 Guru Padmasambhava saw that many of his followers are inadequately prepared for the transfer of many others secret teachings, which he should open and time for that didn't come yet. So he hid many spiritual treasures (terma) in the form of texts, images and ritual supplies, while giving guidance on how to detect them in the future. Subsequently, more than a hundred teachers found these treasures Terma, and gave the teachings to their followers based on them. 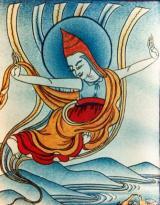 Thus, besides the tantric teachings in Tibet there are lines of continuity, based on the tradition of terma, and including the teachings of the Great Perfection or Dzogchen. 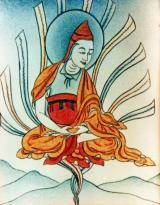 These lines date back to these teachers, as Garab Dorje, Shri Simha, Guru Rinpoche, Jnana Sutra and Vimalamitra and represent unique Nyingma school legacy. In contrast to other Buddhist traditions the Nyingma school until the late period of its development didn't have aim to acquire strong, hierarchically organized structures. Only after the XV century large monasteries, which became university centers, were built. These include Mindroling, founded in 1676 Rigdzin Terdag Lingpa (1646-1714) and Dorje Drag, founded in 1659 Rigdzin Ngagi Wangpo in central Tibet, as well as the monasteries of the Kham province: Palyul, founded in 1665 Rigdzin Kunzang Sheirab, Dzogchen founded in 1685 Dzogchen Pema Rigdzin and Sechen, built Sechen Rabjam in 1735. In addition, in the Amdo province were built Dodrupchen and Darthang monasteries. Main monastic centers were reconstituted in exile in India: Thekchok Namdrol Shedrub Dorje-ling in Karnataka; Ngedon Gatsal-ling in Klementone, Dehradun, Palyul Choyhor-ling and E-vam Gyudmed-ling in Burma and Nechung Drayang-ling in Dharamsala. Until recently, the Nyingma school were headed: His Holiness Dudjom Rinpoche (1904-1987), His Holiness Dilgo Khentse Rinpoche (1910-1991), His Holiness Mindroling Trichen Rinpoche (1930-2008), His Holiness Penor Rinpoche (1932-2009) and His Holiness Kyapje Trulshig Rinpoche.